Mexican authorities are to investigate allegations children battling cancer were given "distilled water" instead of chemotherapy. 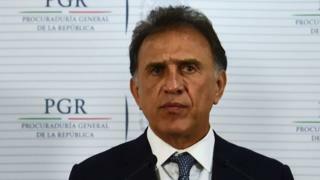 An "in-depth investigation" will look into claims made by Veracruz governor Miguel Angel Yunes Linares on Monday, the Ministry of Health said. He alleged fake medicine had been bought and used in state hospitals under his predecessor Javier Duarte. Mr Duarte has been on the run from the authorities since October. The former governor, who was elected in 2010, has not been seen since a week after he stepped down amid allegations of corruption. He has been charged with organised crime and money laundering, but there are calls for the Attorney General's office to file criminal charges relating to the latest accusations. On Monday, Mr Yunes Linares told a press conference that an investigation into malfeasance and corruption under Mr Duarte had uncovered medical fraud. `We have tests on a medication given to children, a paediatric chemotherapy that wasn't really a medication, it was an inert substance, practically distilled water,'' he said. "This really seems to us a brutal crime, an attempt against the lives of the children. We're finishing our analysis and, at the appropriate time, we'll be filing legal complaints." Mr Yunes Linares also alleged there had been inadequate tests for HIV detection and the existence of outdated medicines. The allegations have shocked Mexico. "It is absolutely inhuman, criminal," Senator Roberto Gil Zuart said, according to Mexican news site Quadratin. Mexico's Secretary of Health José Narro Robles has promised to act on "the persons or companies involved" if irregularities or responsibility is found, the ministry said in a statement on Wednesday.